Hello, Karen here from The Bald Dragonfly with an elegant card with a unique-for-me color combination. 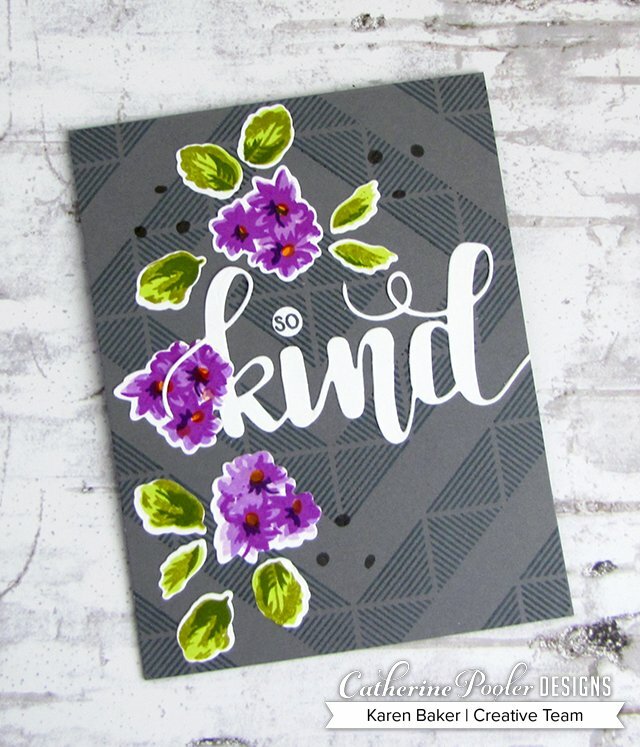 This card features the Rose Garden stamp set from the Kind of Batty release. I started with a card base Smoke card base. I stamped the Angled Squares Background Stamp on the card base with Stone Blue ink for some added interest. I did some multi-step stamping for the cute flowers and leaves, from Rose Garden. these stamps are really easy to line up! The purple flowers use the following ink colors: Sweet Sixteen, Pixie Dust, and Flirty Fuchsia. The centers are stamped with Tiki Torch ink and the leaves use Melon Ice, Green Tea and Eucalyptus. 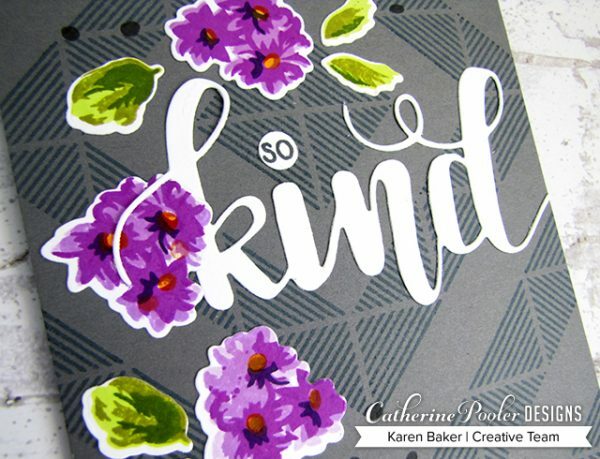 I arranged the flowers and leaves around a die cut “Kind”, from the Three of a Kind Word Die. I used only the first layer of the three dies, and I think it looks awesome. The small word “so”, from the corresponding stamp set, was stamped in Stone Blue ink. I finished the card with a series of dots from Rose Garden. I really enjoy this unique color combination. I'm so happy that I stepped outside my comfort zone and tried it. I hope you'll do the same. I can't wait to see how you might have been inspired! Beautiful card! Sometimes I get nervous trying to be bold with colors like that, but you are a great encouragement for stepping out of the comfort zone. You did a fantastic job!